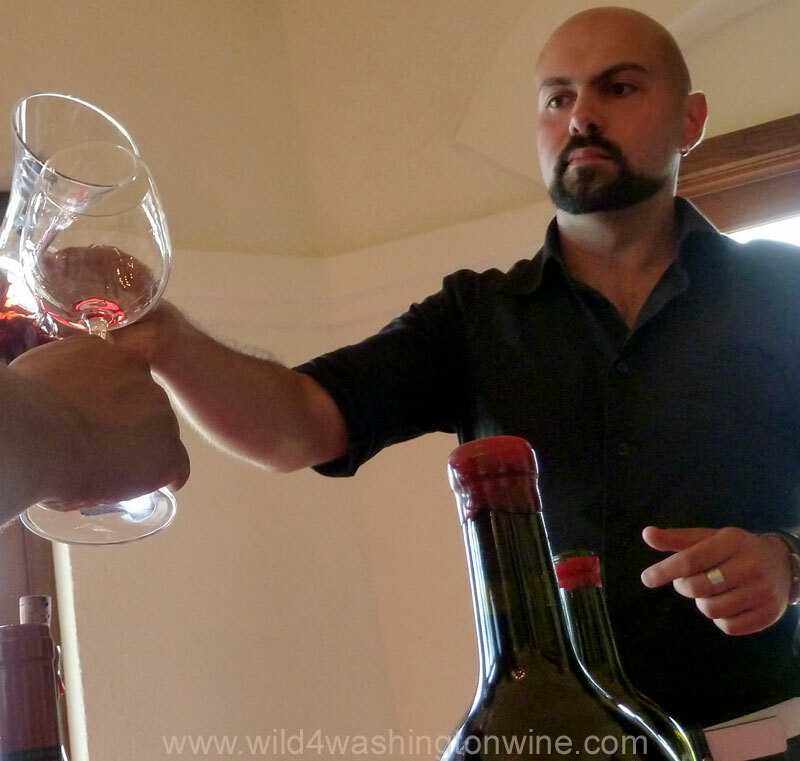 Writing about a world of wine, not just Washington state. 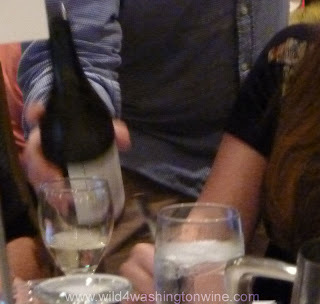 It's time to share my impressions of Virginia Wine with you. Plaque of Thomas Jefferson at Barboursville Vineyard. 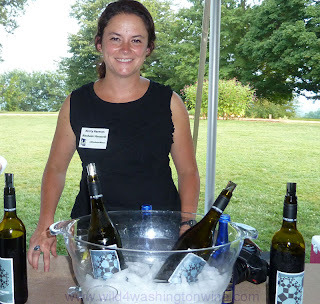 Last night I dreamed about Virginia winemaker Kirsty Harmon. Before bed, I was editing a short video of Kirsty I recorded last month at Monticello; her words and others were tumbling in my mind. When I start dreaming about a subject, I know it's time to start writing about that subject. 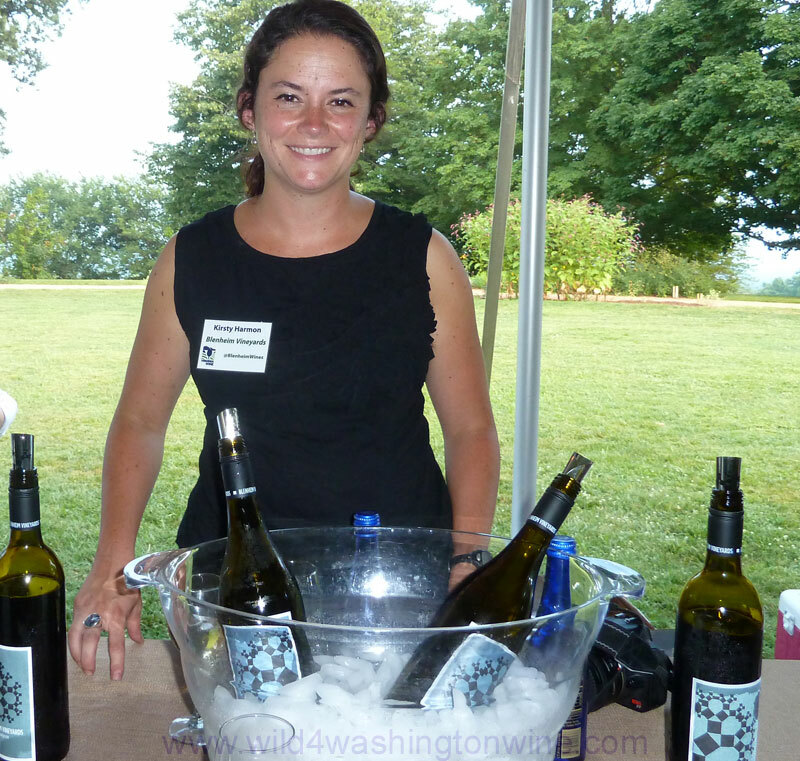 Kirsty is the winemaker at Blenheim Vineyards; she was among 30+ Virginia wineries sharing their wines last month in Virginia at the fourth annual Wine Bloggers Conference. I had a magnificent time in Virginia, very little sleep, but many captivating conversations. My palate has been expanded. I've finally experienced Virginia wines. 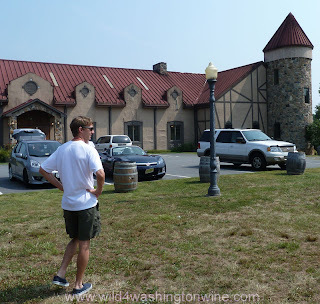 I’m excited about and for Virginia wineries and I discovered that there are some real gems, wines easily recognizable as world class. Just what's going on in Virginia? The original colonies were mandated by England to grow vinifera and to make wine. They failed miserably. 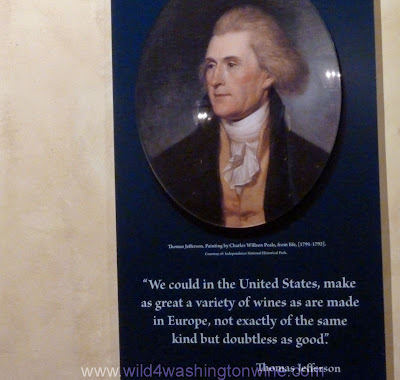 Even Thomas Jefferson struggled for 30 years to grow vinifera, without success. 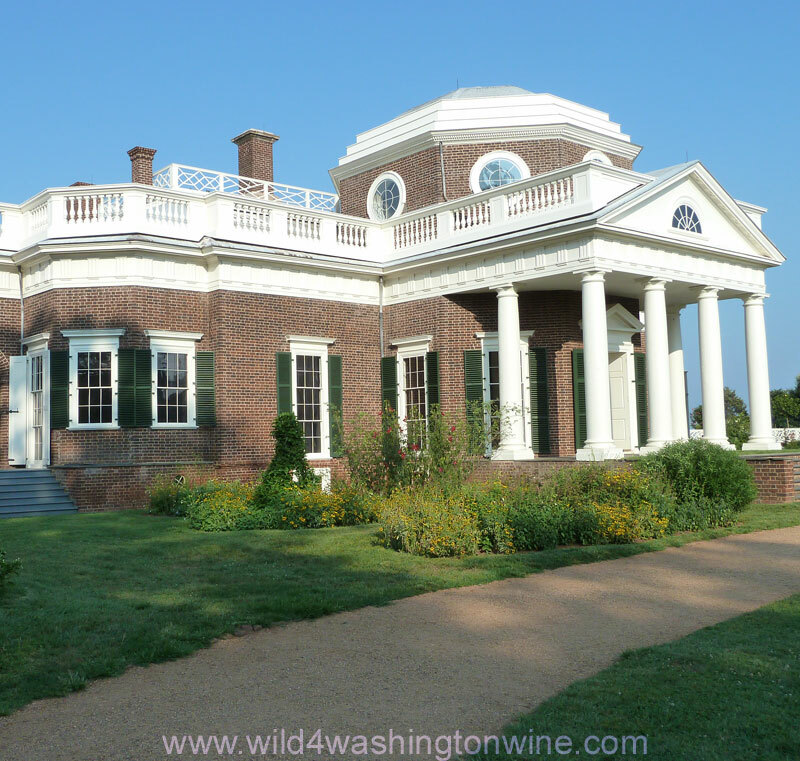 Today Jefferson’s vision has been realized by the success of 193 Virginia wineries. Virginia is now the fifth largest wine producing state in the United States. While Virginia only produces 500,000 cases annually, it is well on its way to becoming a world class wine producing region. Last month I was fortunate to spend three days in Charlottesville, Virginia wine tasting. Charlottesville is home to the University of Virginia, rolling hills, tree lined winding roads and is now a destination for wine lovers. I enjoyed the vibrant life of Charlottesville, a city where I met a growing, thriving, focused, passionate and determined wine industry. 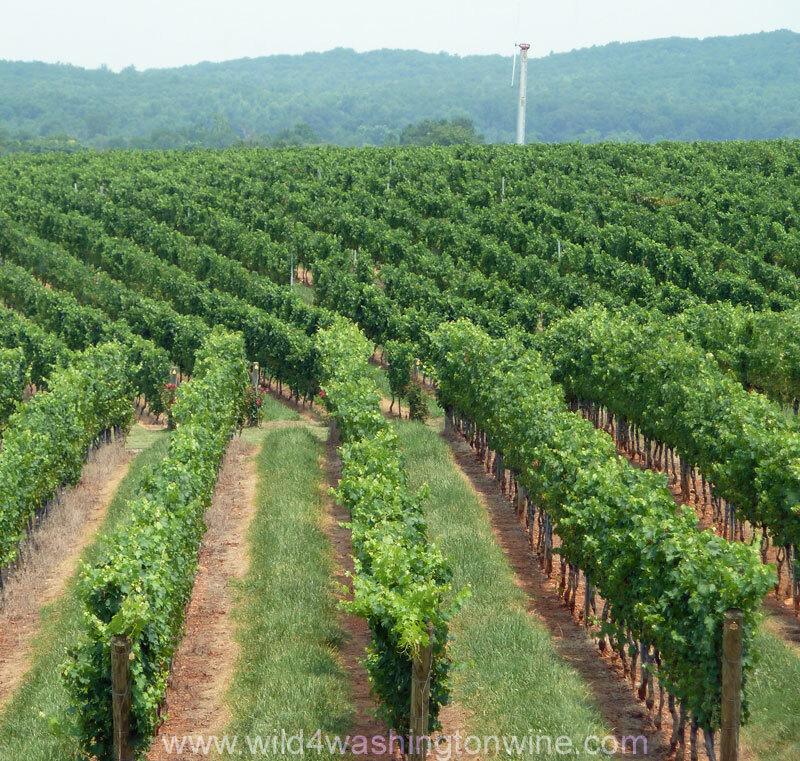 Believe me, it takes passion and determination to grow wine grapes in Virginia. The hot, humid climate is conducive to rot, mildew, mold and vine pests. The vineyards have to be constantly tended, nurtured and maintained - walking the vines is often a daily routine. 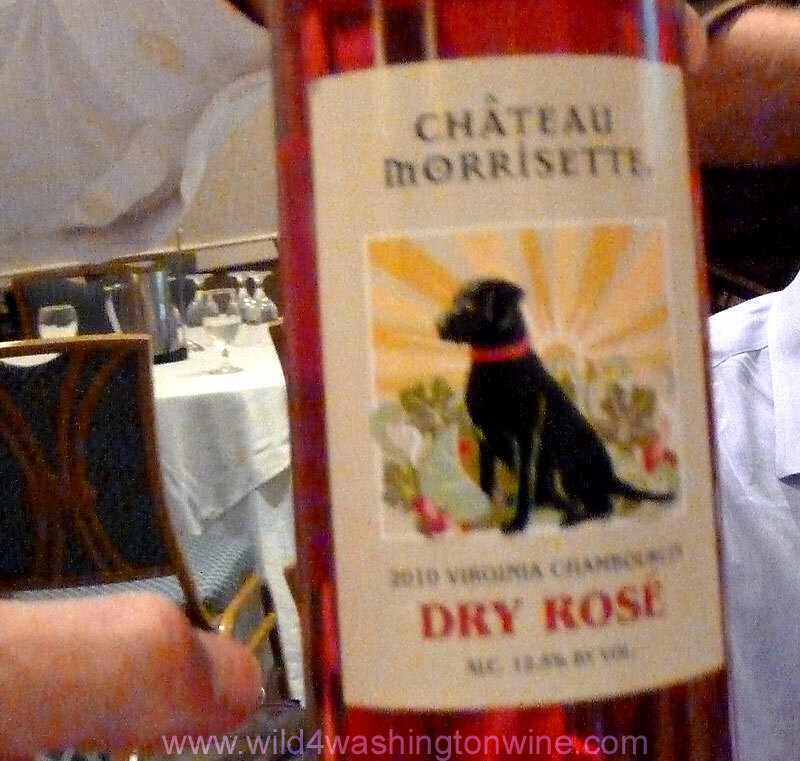 I heard from several Virginia Winemakers, "Vintage is everything." 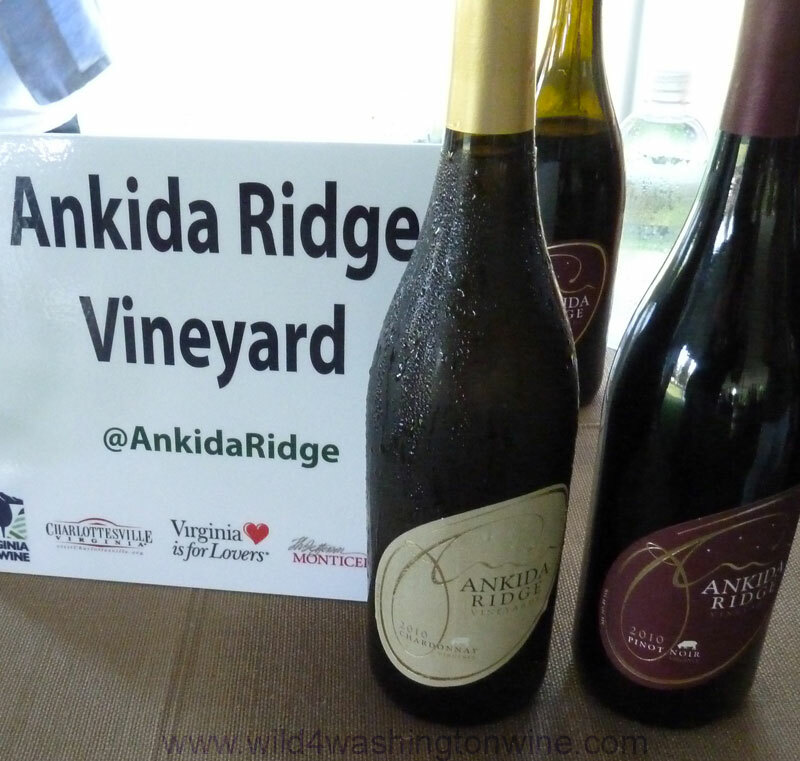 The challenges faced by Virginia wineries exceed those faced by the wineries in my native Washington State. Even so, the obsession and dedication for wine was palpable, I was impressed by the Virginia winemakers I met. It may have taken a couple hundred years for Virginia to reach this point, but they are now making wines I like and wines which should be coveted and collected. It is an exciting time to be a winery in Virginia. On Friday, July 22nd I had the privilege of wine tasting at Monticello, yes that would be Thomas Jefferson’s estate. 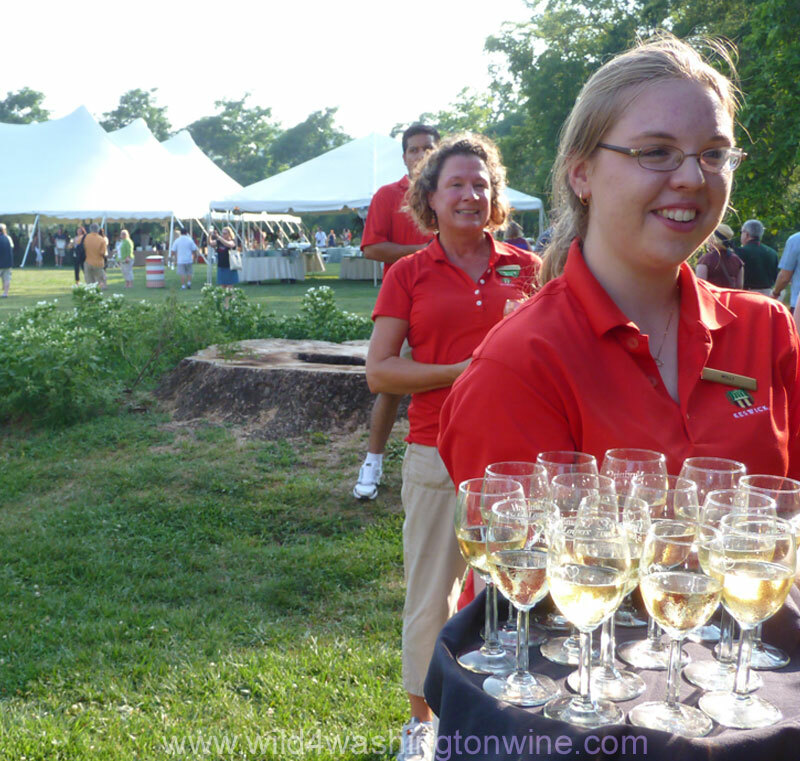 Monticello made for a beautiful outdoor setting, over 30 wineries were under an enormous white tent sharing the joy of their labors. Unfortunately, the weather was ugly; everyone suffered from the oppressive heat and humidity. Those conditions make for a brutal and unfair presentation of anyone’s wine. In other words, most of the red wines were too warm to appreciate; I was too hot, the winemakers were too hot, it was wicked outside. 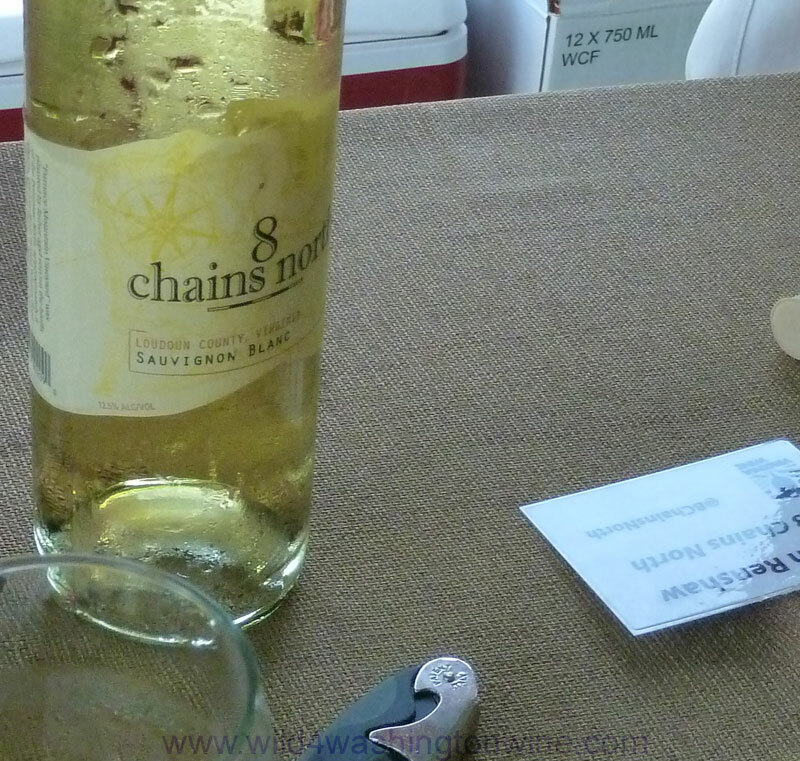 Fortunately, many of the white wines were on ice, accordingly they received the most attention. Even in these conditions, I was surprised and impressed by several winemakers and their wines. 8 Chains North 2008 Sauvignon Blanc. Ben was the first Virginia winemaker I had the pleasure of meeting. His perspiration and fervor were obvious. Ben is having no trouble selling his wines, but sourcing an adequate supply of fruit is his next challenge. I enjoyed his 2008 Sauvignon Blanc and his 2008 Furnace Mountain Red Reserve. Winemaker Matthieu Finot (consulting winemaker) Their grapes are planted at an elevation of 1800 feet, in rocks and steep narrow rows of vines. They have no level ground. Their grapes were planted in 2008 and their first vintages were shown at this event at Monticello. I sampled their 2010 Chardonnay and 2010 Pinot Noir. I can tell you that their future is bright and their vintages will only continue to improve. 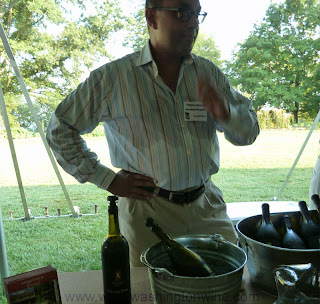 Stephan Ballard pouring for Annefield Vineyards. 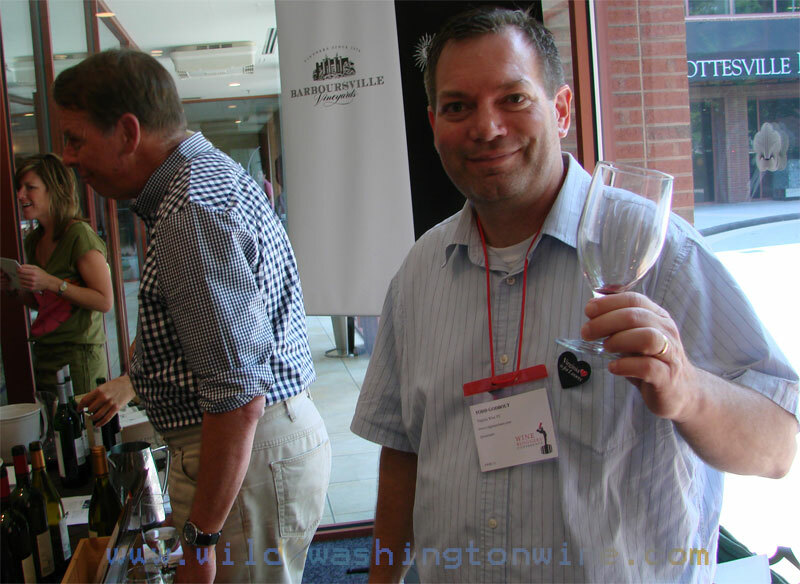 Winemaker Michael Shape (consulting winemaker). Stephan Ballard poured for me 2010 Viognier and 2010 Cabernet Franc. In the photo you may notice his shirt is soaking wet from perspiration. Captivating winemaker Kirsty Harmon of Blenheim Vineyards. Kirsty impressed me with her intelligence, inner sparkle and passion for wine. She came right back at me after my little jibe, I said “So you make Pinot because you’re stubborn?” and she returned with, “No, I make Cabernet Sauvignon because I’m stubborn.” Bravo Kirsty. I enjoyed meeting this winemaker and look forward to sampling her wines in more gentle conditions. Kirsty was pouring 2010 Viognier and 2009 Cabernet Sauvignon. 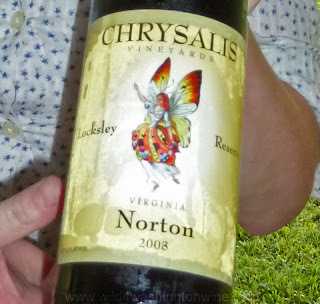 Chrysalis Vineyards Virginia Norton, one of the wines I knew about. Winemaker Alan Kinne works for Jennifer McCloud, Ms. McCloud was featured in the book, “The Wild Vine” A Forgotten Grape and the Untold Story of American Wine, by Todd Kliman. It was a pleasure meeting Alan and Jennifer both. They shared with me their 2010 Viognier and their 2008 Norton (their Norton is one of the reasons I wanted to go to Virginia). They also had a lovely, chilled Rose called Mariposa on hand too. These are wines I’d like to have on hand to share with friends. Winemaker Andy Reagan. 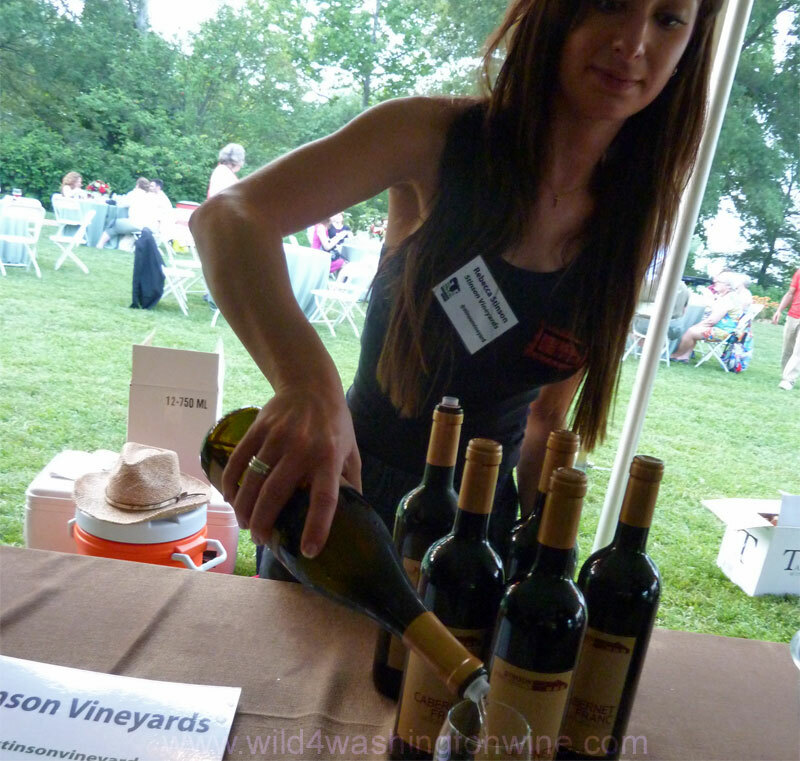 Jefferson Vineyards was pouring 2010 Viognier and 2008 Meritage. While the vines are all newer planting, the vineyards are the realization of Jefferson’s dream for the native production of wine in Virginia. Rebecca Stinson pouring for me. Winemaker Matthieu Finot (consulting winemaker). Rebecca Stinson poured for me their 2010 Sauvignon Blanc and 2010 Cabernet Franc. She and her father were very friendly and I enjoyed my visit with both of them. Her father even offered me a job pouring and selling wine for them. Hmmm, tempting, but have I mentioned the summer heat and humidity? Even in the heat I enjoyed their wines. Tarara Winery Casa NoVA red wine. 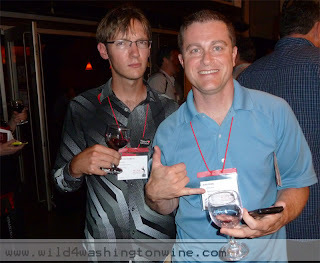 Winemaker Jordon Harris was not at Monticello Friday, but he did pour for me on Saturday at the speed blogging session. On Friday Sonya Farrell poured 2010 Viognier and 2008 Navaeh Red. 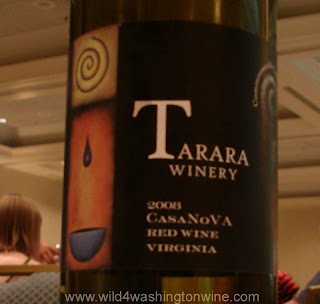 *‎Note from the speed blogging session: The 2008 Casanova red wine is inky dark, a focused wine barrel nose, smooth, good grip, the nose must be a Virginia thing, which is growing on me. Food wine, Jordan Harris winemaker, $50, liking more, okay I'm starting to dig on this. 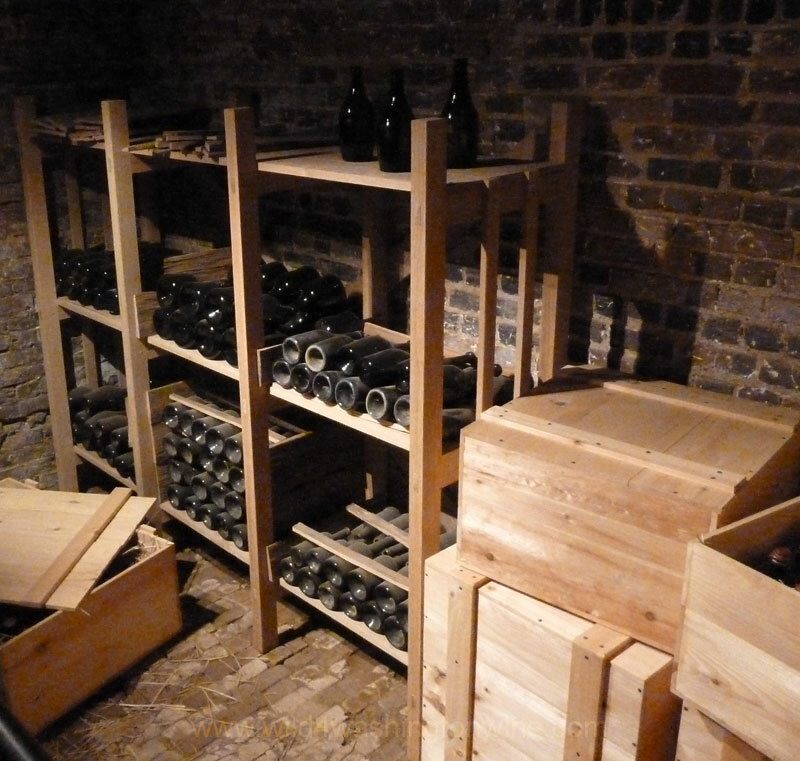 Thomas Jeffersons restored wine cellar at Monticello. 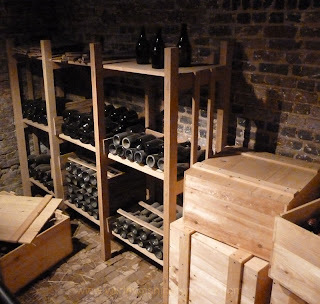 Another highlight of my time spent at Monticello, was my conversation with Justin Sarafin, Curator at Monticello and involved with the restoration of Jefferson’s wine cellar – link to video. *Following are some tasting notes on Virginia wines, sampled at the speed blogging session, these tastings only allow for five minutes to taste and tweet about the wines, so my notes are what they are. 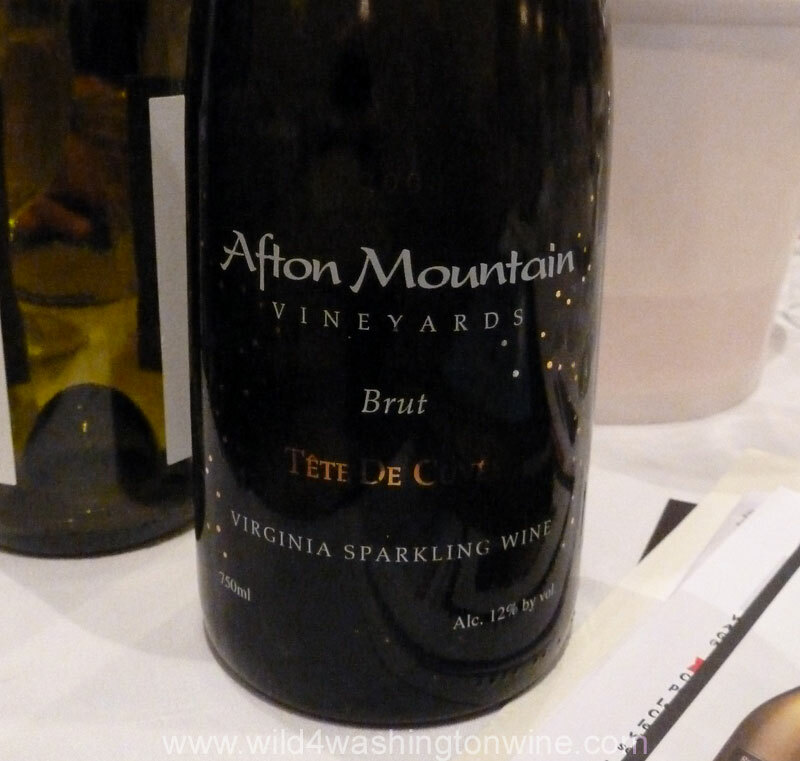 Afton Mountain Vineyard Sparkling Wine. 2006 Tete De Cuvee, Brut, Virginia Sparkling wine $30 (just released), great bubbles (foam) that fill the mouth, light, crisp granny smith apples. I like it. 2010 Vidal Blanc, smells like a Riesling, it’s tart, fruity, apple-pear, a little spritzy, $16 retail. 2010 Dry Rosé, more of what I expect in a Rosé, with strawberry, light, proper acidity, a summer wine, with a good finish, would pair well with turkey, cold cuts, and picnics. Could be a great base for a sorbet. Clean finish. Winemaker Riaan Rossouw. I enjoyed their 2006 Pinotage, good weight, smooth, fruit, pleasantly dry, probably a good food wine, old school style, I like this wine, a good everyday drinker, a subtle wine. A Good expression of the varietal, grace and elegance. Balls on the floor South African winemaker, 12.5% alcohol, ripen slow. Did I mention I like this wine? Make it what it is, an authentic wine, retail price $24. 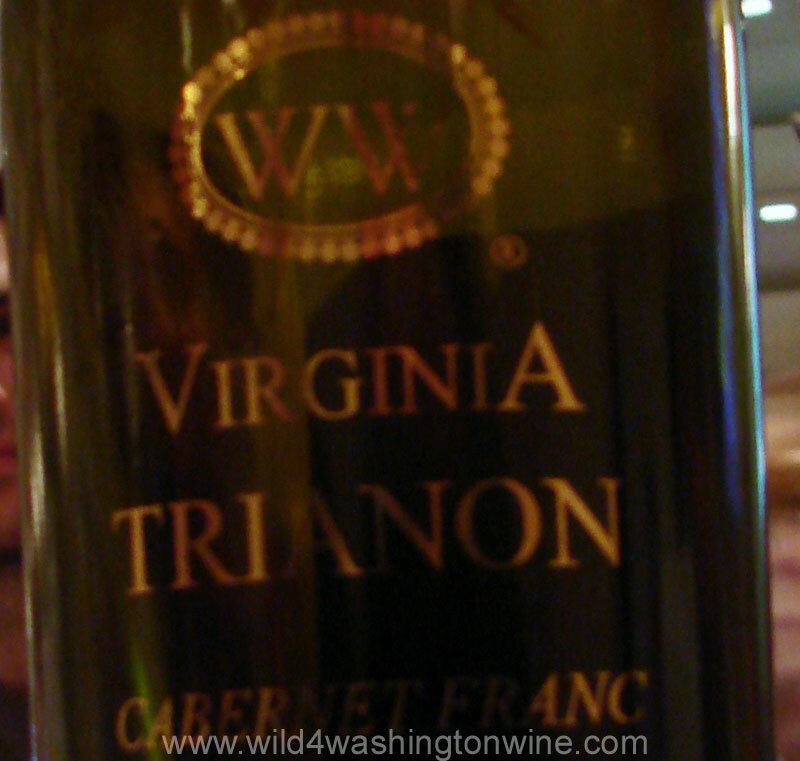 Trianon 2007 Cabernet Franc, 18 mo oak, some new and some neutral, medium light, smooth, tasty, good fruit, food wine, just right dry, elegant finish, raspberry compote, chocolate, lovely wine, impressive Cabernet Franc $32, I think priced right. Recommended. Veritas Vineyard Winemaker Emily Pelton. 2010 Sauvignon Blanc Reserve, tropical nose, crispy, Emily Pelton is the winemaker. Passionate winemaker. Fermented in 100% stainless, neutral barrels, New Zealand style, de-stemmed, super-extracted $25 retail. 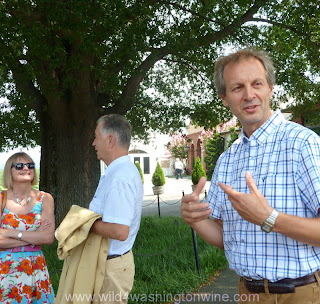 The heat and cacophony of Friday’s tasting at Monticello were replaced by a more leisurely paced Saturday wine tour. 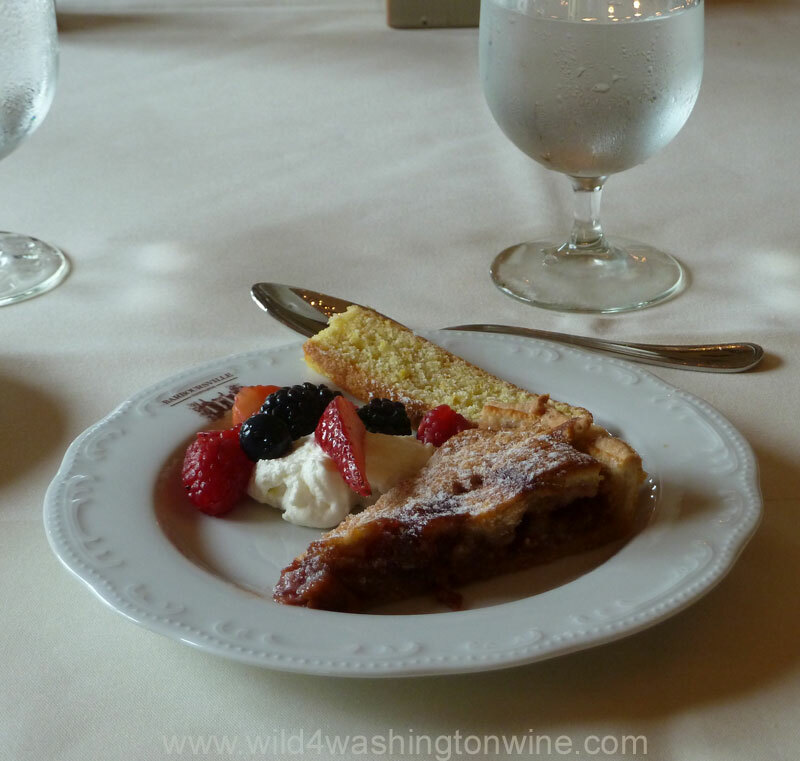 Loaded onto an air conditioned bus, we enjoyed more traditional tastings at two of Virginia’s oldest wineries, Horton Vineyards and Barboursville Vineyards. In 1988 Dennis Horton and business partner Joan Bieda started Horton Vineyards. Their first small crop was harvested in 1991. Winemaker Mike Henny was our genial guide on Saturday. They have a unique vineyard utilizing the "open lyre" training system, which promotes ideal ripening. I was amazed by how the vines are trained. The vines are so tall, they look almost like trees. We were dwarfed by the size of the vines at Horton Vineyard. I have a short video of Mr. Horton and Mike Henny talking about their vineyards and trellace system (vineyard video). The stone cellar at Horton Vineyard was cool and comfortable. Our visit to their winery and a tour of their stone underground cellar made for a delightful retreat from the summer heat. They make a lot of different wines at Horton, their Sparkling Viognier, Petit Manseng and Horton Norton were some of my favorites. Horton Vineyards 2008 Petit Manseng. Horton Norton - not only was it good, it has a cool name too. 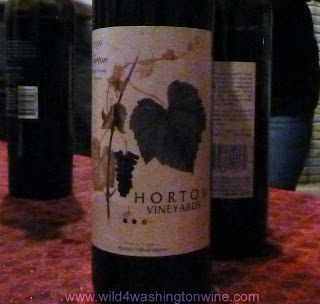 A small example of the many Horton Vineyards wines. 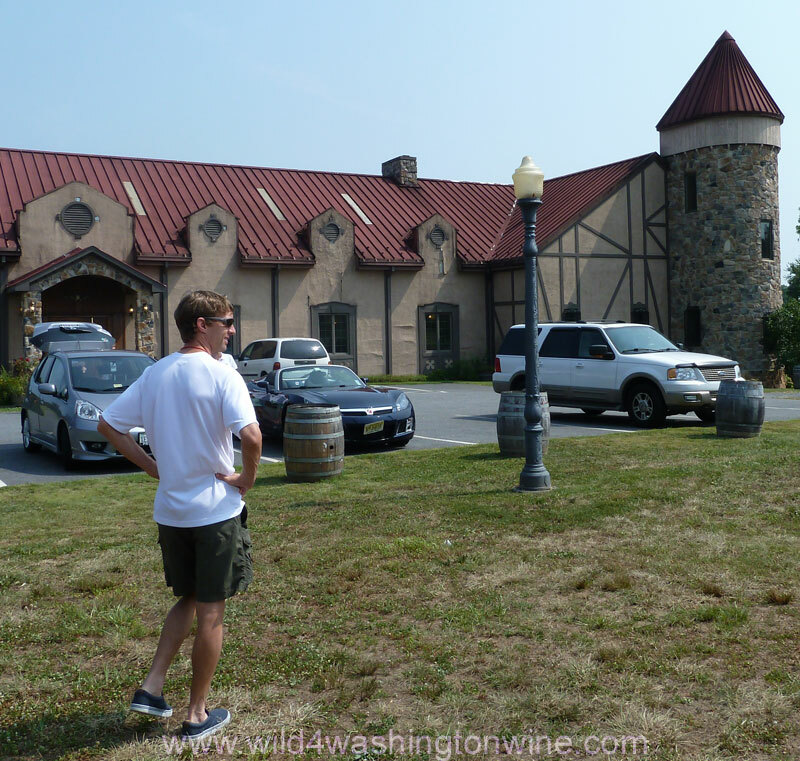 Our next stop was at Barboursville Vineyards, Virginias oldest winery. Barboursville was started by Gianni Zonin in 1977. Mr. Zonin and his lovely wife were our gracious hosts, while winemaker Luca Paschina was our amiable guide and translator. We were treated to a fantastic meal and some amazing wines. I felt honored that Mr. Zonin and Mr. Paschina shared vertical tastings of their best wines. Owner Gianni Zonin speaks with wine critic Jancis Robinson, winemaker Luca Paschina at right. 1. Video - Barboursville Vineyards History and Founding of the Estate. 2. Video - Owner Gianni Zonin Makes a Toast in Italian. 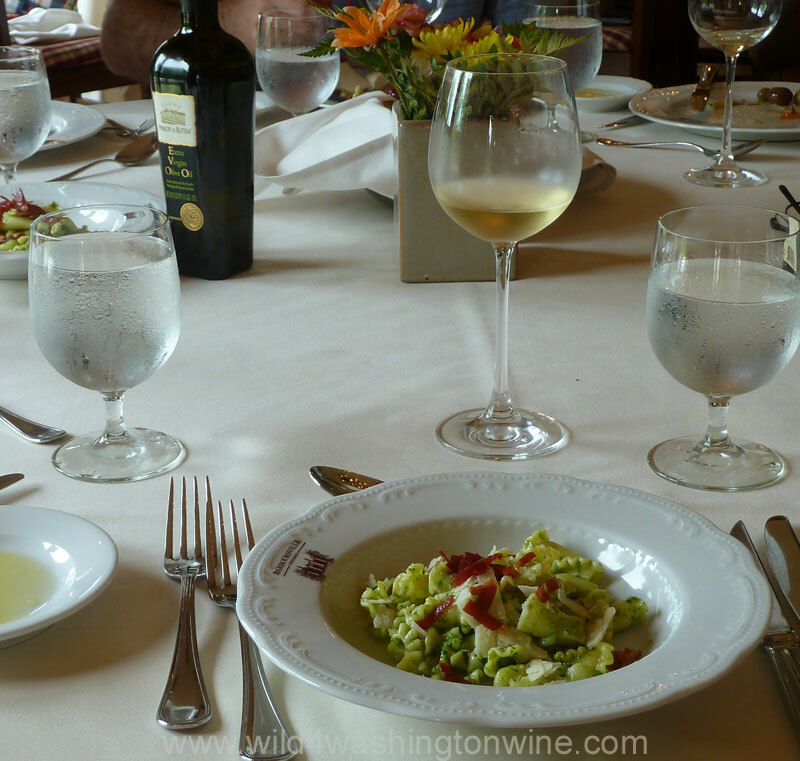 Barboursville also has a restaurant called Palladio, with a James Beard awarded chef, which makes this a must visit destination and one of the compelling reasons I want to return. The staff at Barboursville is very professional; elegant settings, correct and courteous pours. We were not told which wines to drink, it was assumed we knew the proper order. I like that they showed us courtesy and respect (some wineries could learn a lot by a visit to Barboursville). 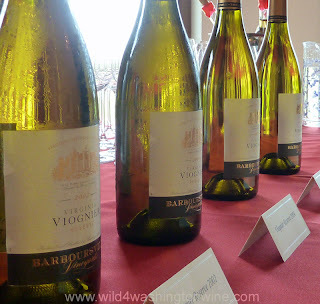 My favorite Barboursville wines were from their library, the 2002 Viognier was sheerest elegance and grace, and a beautiful example of how age worthy Virginia Viognier can be. But, I have to admit that the 2010 Viognier was classic Viognier, bright, floral, and wonderful. Library of lovely red wines to taste. My other favorite, out of many delicious red wines, was their 1998 Cabernet Franc, decadent, collectible and a showcase wine. Assistant winemaker Daniele Tessaro pours. At the red wine speed blogging session, Daniele Tessaro Assistant Winemaker, poured the 2006 Octogon red blend. It is a dark wine made from the best fruit of year, no over extraction, balanced old world style, refined flavors, dry, still improving, age worthy, good finish...Virginia nose, very interesting wine, I suggest you track some down. Like. Like. Like. 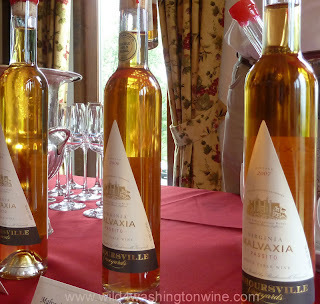 Barboursville vertical of Malvaxia Passito. 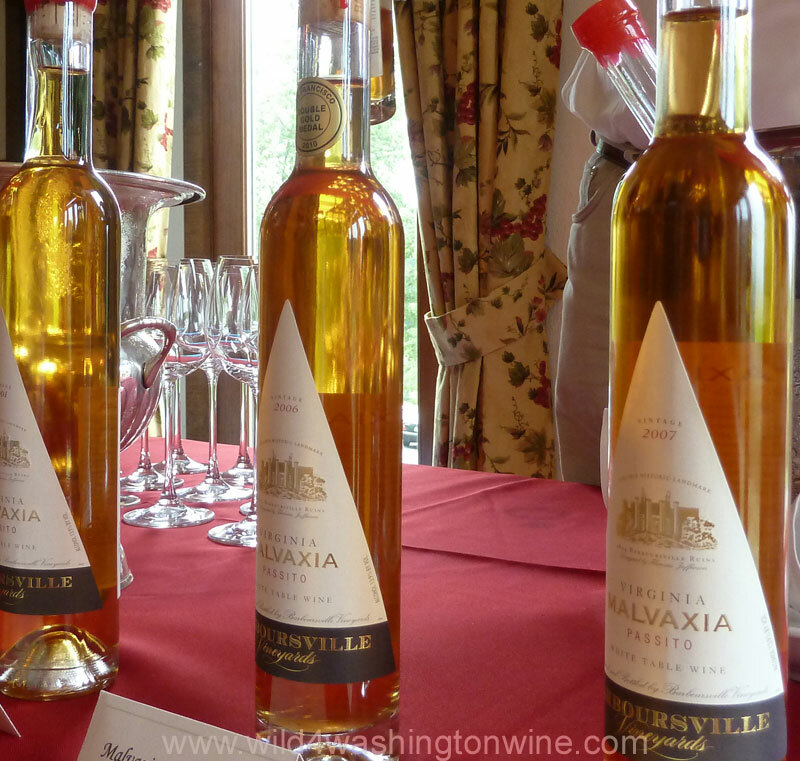 I was also impressed by their Malvaxia Passito, an interesting limited production dessert wine, the grapes are hand selected, and air-dried in racks for 120 days before processing, then a slow cool fermentation of up to 6 months followed by aging in small barriques. 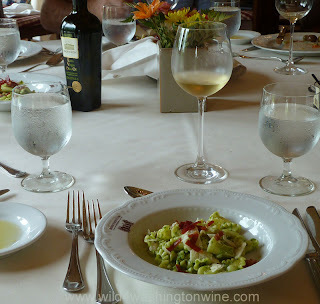 The food at Barboursville was wonderful, the wines impressive and the staff professional, courteous and classy - bravo. 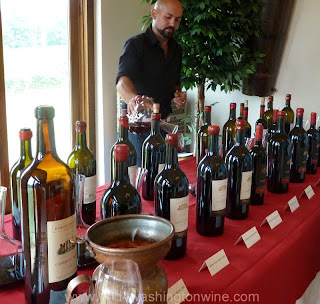 It is quite evident that Barboursville Vineyards is the current gem of Virginia wineries. 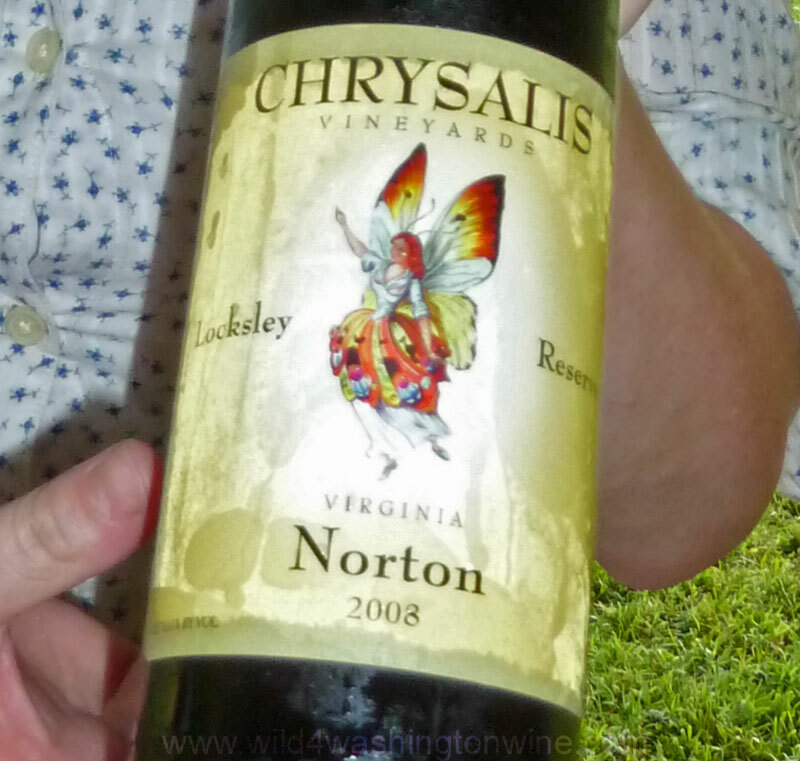 They are a beautiful example of what Virginia wine can be. I was very impressed and hope to return. Saturday night the bells started to chime in my head. My enthusiasm for Virginia wine began to manifest itself by percolating out my mouth, “Did you try the Norton?” “Wasn’t that Viognier amazing?” “You’ll never believe where we had lunch.” “Wasn’t that fun?” I had slept little, perspired, tasted, spit, talked, and perspired some more, but the east coast heat wave and lack of rest could not diminish my growing excitement. 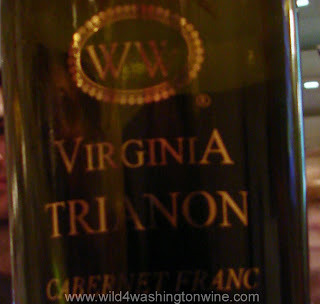 I was starting to understand a little of what was going on with Virginia wine. Yes Virginia, You Do Make World Class Wine. Overall, my impression of the wines of Virginia is positive. 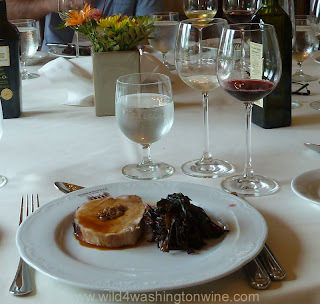 Stylistically, Virginia wines are different from the wines I drink at home in Washington State. Their wines are more subtle, complimenting the cuisine and hospitality of Virginia. You’ll find a lot of Viognier and Cabernet Franc, because those grapes grow well there. But you’ll also see many other varietals too; like the Norton and Petit Manseng. Saturday night on Charlottesville City Mall. 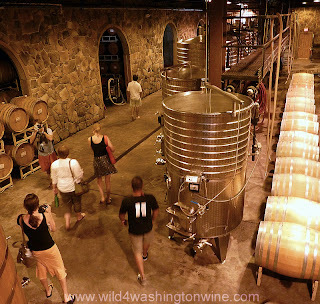 Charlottesville and Virginia wine country should be on every wine enthusiast must visit list. After only three days in Virginia, I have the beginning of an understanding of Virginia Wine. Its quality is obvious, its character diverse and changing. Several of the wines I tasted where made from young vines, being only the first or second harvest - their quality will continue to evolve – that’s exciting. I’d like to give my heartfelt thanks to the city of Charlottesville, the Common Wealth of Virginia, the Virginia Wine Association, the Omni hotel, the many Virginia wineries who poured for me, the fiercely proud and loyal Virginia Wine Bloggers, the many wonderful sponsors and wine distributors, Zephyr Adventures who planned, coordinated and executed this amazing wine experience, and of course thank you to the many staff, restaurateurs, and friendly citizens of Virginia. It was an honor to meet the people of the Virginia wine industry. 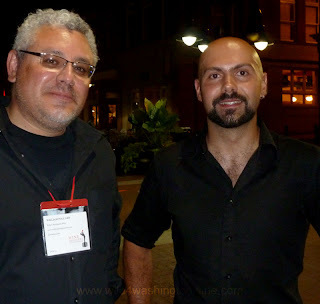 Saturday night posing with Daniele Tessaro. 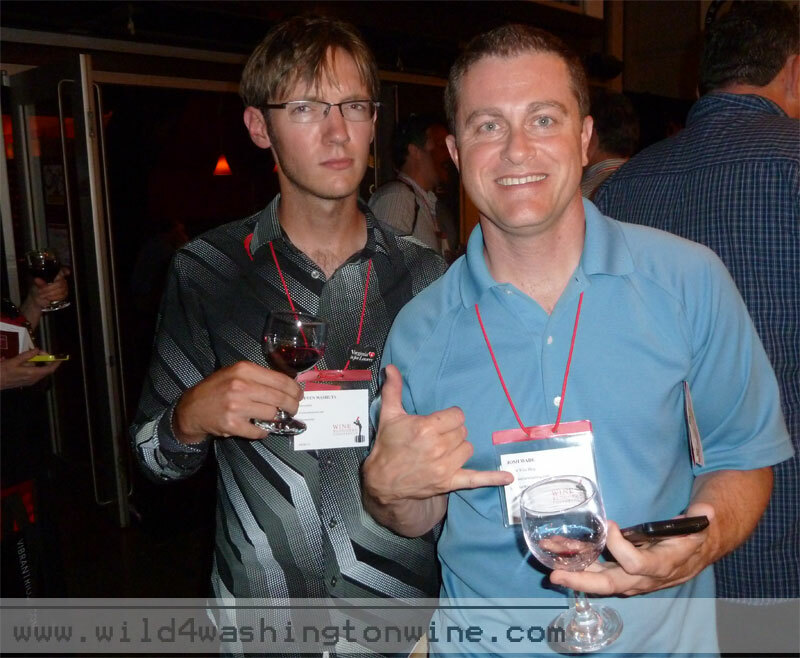 Virginia wine blogger Todd Godbout, of www.virginiawinetv.com. Steven Washuta and Josh Wade - Josh is from Spokane, WA of www.drinknectar.com. Also a big shout-out to all of my new wine tweeps. It was great meeting you and sharing a mutual appreciation for wine. Let’s do this again. My wife asked me if I would want to go back to Charlottesville and the Commonwealth of Virginia, my answer was a definite yes! But I will not return during the middle of summer. I'm told spring and fall are beautiful seasons in Virginia. I like all the photos you took. 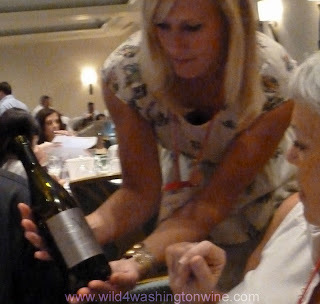 That was one thing I didn't do well enough at #wbc11, but I took so much home from the experience that I can't really feel bag. I tend to dream about the subject most vivid in my mind when I go to bed. One of the reasons I blog, is to help me sleep at night. When we were at Monticello, I had not slept in over 30 hours so my videos and photos suffered (my flight was cancelled out of Atlanta - night in airport, re-routed in morning- but I made it to Charlottesville). Yes, it was a great experience. Honestly, I'm surprised I had such a great time - more surprised that I want to go back. Loved reading your post. It makes me thirsty and hungry. I hope you come back to Virginia again and when you do give us a heads up. I look forward to visiting Washington soon too. I look forward to returning to Virginia. You'll have a great time in Washington State too. Let me know when and I can give you many great suggestions. Way to hang in there at Monticello! With the heat, I'm impressed! Hi there - great review! Just wanted to point out that Jefferson Vineyards is not connected to Monticello (they are a bit sensitive about this). We are located just down the road on property that was originally owned by good ol' T.J., but was deeded to his friend Phillipo Mazzei so that they could start a wine business. Also, we are one of the older vineyards in the state, along with Barboursville, not quite a "recent planting," although much more recent than Thomas Jefferson's original vines :-) We are so glad you enjoyed your time in VA wine country - come back soon! 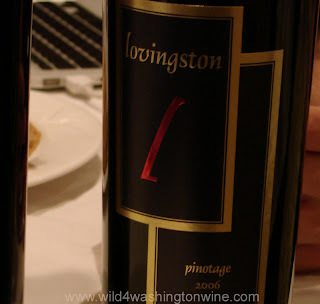 My palate and this blog, began with Washington wine. Washington state is where I grew up and now work in the wine industry. 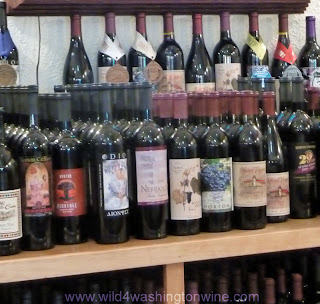 Washington wine is my point of origin, my reference point. It is where my passion for wine began. Today, I embrace the world of wine. Not just Washington wine. 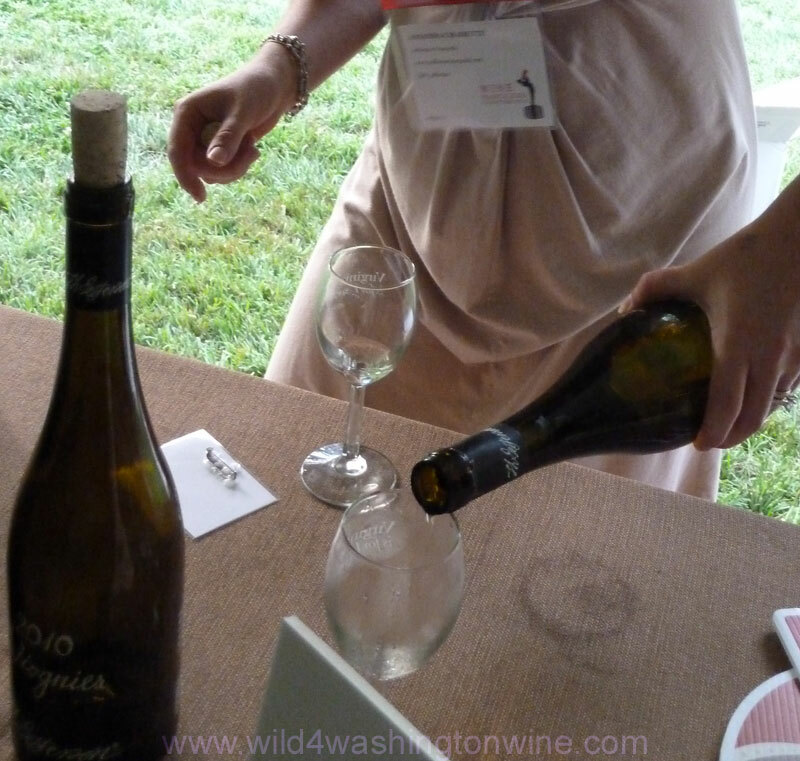 I love comparing Washington wine to the wines of the world. Not good vs bad, but different vs. different. 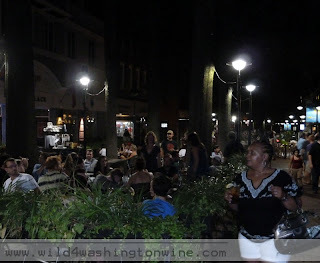 I hope what I share compels you to explore wines where you live and the wines of the world. 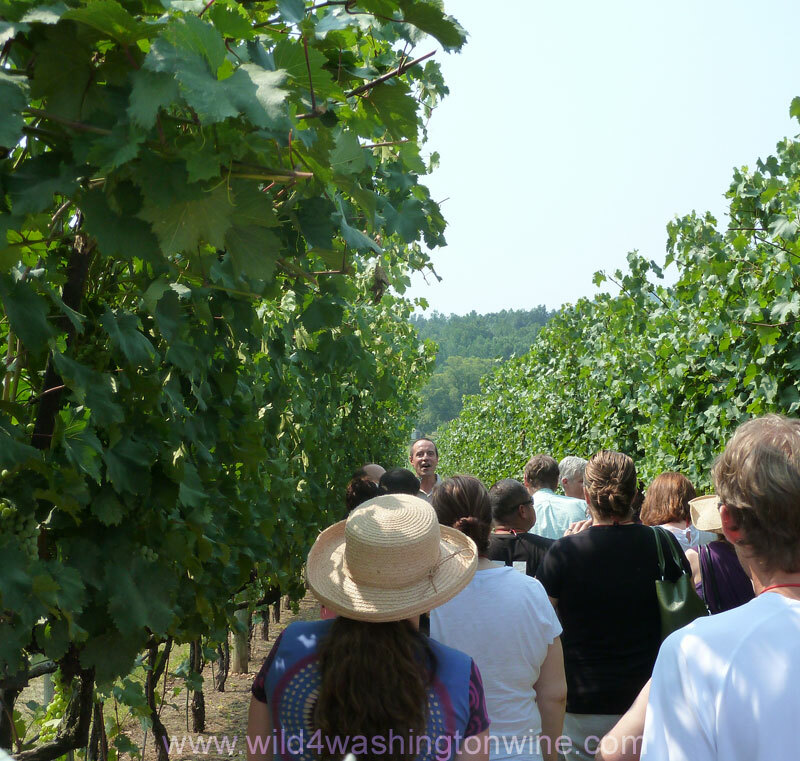 And experience the marvels of Washington wine too.